New head coach Kirby Smart might be preparing for next Monday’s College Football Championship Game with Alabama going up against Clemson. However, he has still made time to hire new coaches to the program. 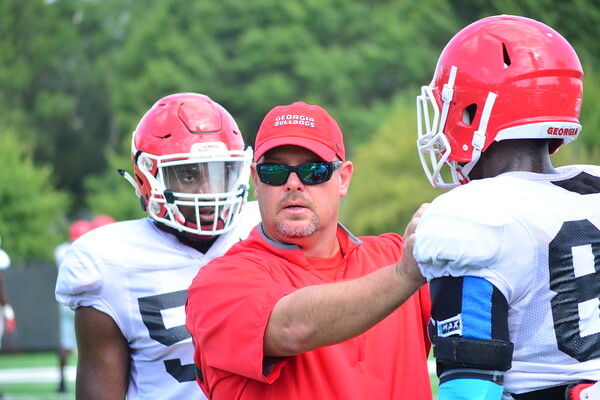 On Sunday, Smart added new wide receivers coach James Coley, running backs Dell McGee and Malcolm Malchow will lead the recruiting department. Then, on Tuesday the Bulldogs added new tight ends/special teams coach Shane Beamer. Beamer has coached the last five seasons for his father, Frank at Virginia Tech. These coaches will join newly named offensive coordinator/quarterbacks coach Jim Chaney and offensive line coach Sam Pittman. These two coaches were named before Georgia began bowl practice and did observe their new team during those workouts. Today, a report has surfaced about the hiring of new strength and conditioning coach Scott Sinclair from Marshall. He has been at Marshall since 2013 and is reportedly bringing Central Florida’s Ed Ellis along as well. This news was reported first by the website, FootballScoop.com. University of Georgia made the news officially just before 3 pm local time. This means that previous head strength and conditioning coach Mark Hocke will likely not be retained, after just one season at UGA. He previously worked at Alabama. These new coaches will also join defensive line coach Tracy Rocker and outside linebackers Kevin Sherrer, who were held over from the previous coaching staff. Smart also already added Alabama director of player personnel Glenn Schumann to the staff as a defensive staff member. Georgia still needs to add an inside linebackers coach to take over for the departing Mike Ekeler. Also they will need to add a secondary coach for the exiting Jeremy Pruitt, if indeed Smart decides not to coach either of these positions himself. Smart played safety and has coached the position during his career. He is currently in charge of the inside linebackers group at Alabama. The Bulldogs new head coach can officially take over the program on January 12, a day after the Crimson Tide play Clemson in the CFP Championship Game. This means that he will have 23 days on the job, leading up to National Signing Day on February 3.